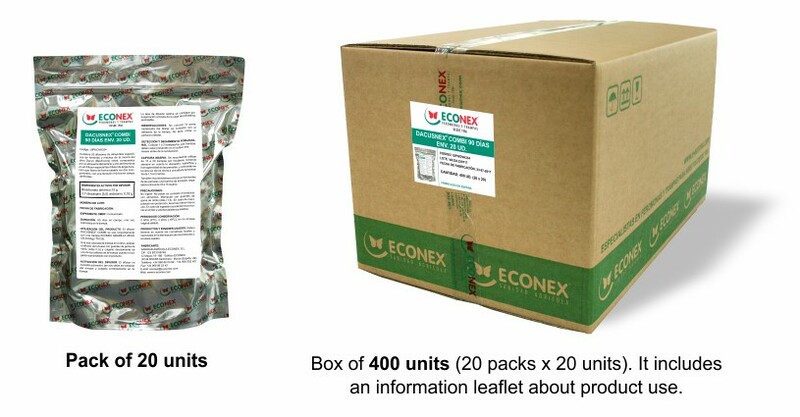 Regarding quantitative damages, they are caused by second stage larvae and especially third stage larvae. 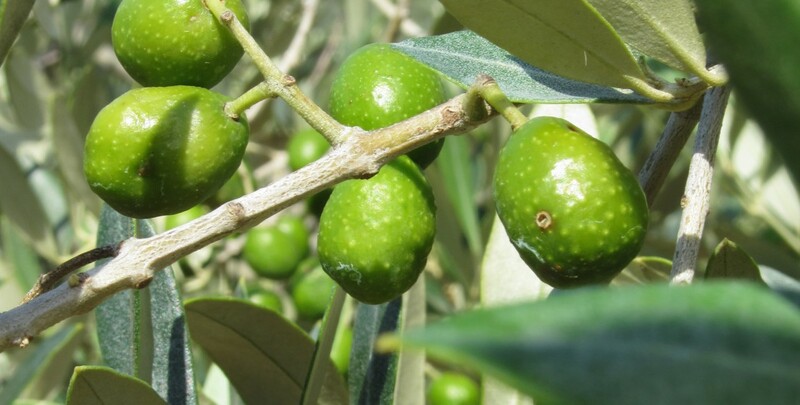 They consume an important amount of the olive’s pulp which, as a consequence, reduces the performance of the oil. 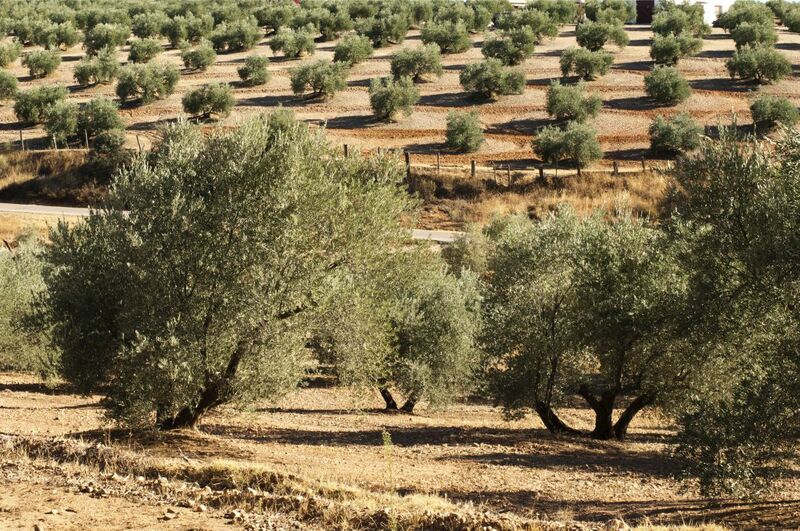 Part of the production is lost because the olives that have been attacked fall prematurely from the tree. 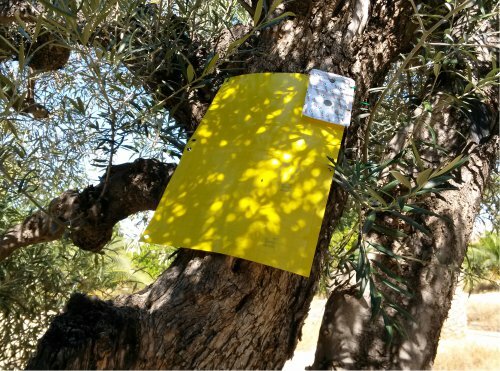 In olives used to produce oil, damage caused by the egg laying and the first stage larvae do not have significant economic impact. However, for table olives, the egg laying depreciates the value of the product. Pheromone diffuser to attract the olive fruit fly males Bactrocera oleae + 1 hanger in the form of a clip. It lasts 60 days in field conditions. 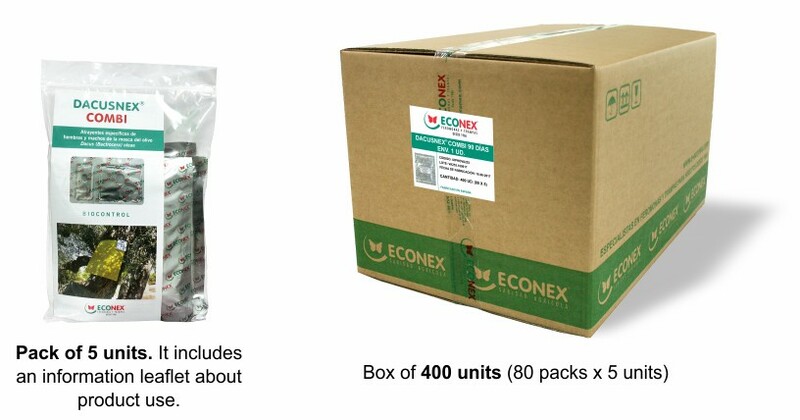 The diffuser is a polyethylene tube that is individually packaged in an aluminium sachet with label specifications. The pheromone diffuser is used with an ECONEX YELLOW CHROMATIC 40 X 25 CM, so the flies attracted by the diffuser are caught on the surface of the trap. 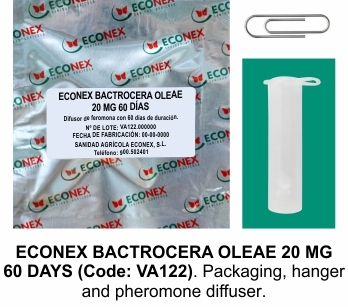 Once the trap has been placed in the olive tree, hang the ECONEX BACTROCERA OLEAE 20 MG 60 DAYS diffuser from one of the holes on the trap. 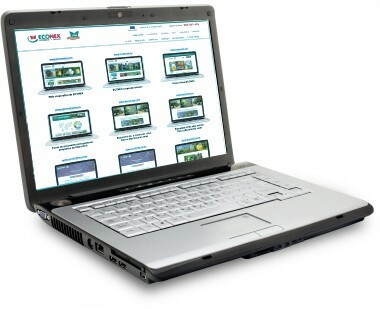 Use the hanger provided with the product. 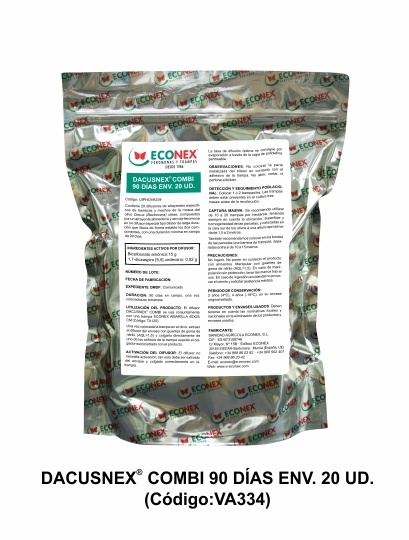 DACUSNEX® COMBI 90 DAYS is a combination of 2 attractants: a food attractant and a pheromone attractant of Bactrocera oleae. It is used to attract males and females of the olive fruit fly. 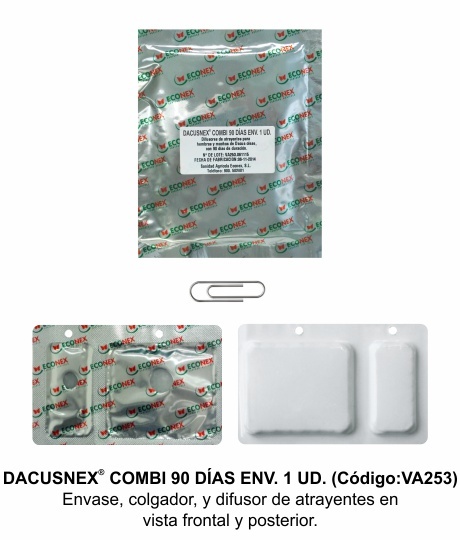 DACUSNEX® COMBI 90 DAYS is used with an ECONEX YELLOW CHROMATIC 40 X 25 CM, so the flies attracted by the diffuser are caught on the surface of the trap. ECONEX YELLOW CHROMATIC 40 X 25 CM (Code: TA125). 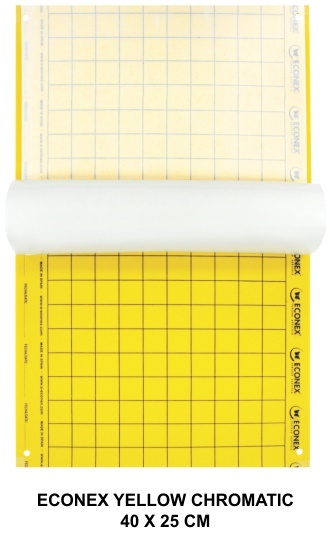 ECONEX YELLOW CHROMATIC 40 X 25 CM is an adhesive trap, made of a yellow polythene sheet resistant to sunlight and with a 2×2 black grid on either side, to facilitate counting the captured insects. The sheet is coated on both sides with a pressure-sensitive adhesive, without solvents which is protected by sheets of translucent silicone paper. 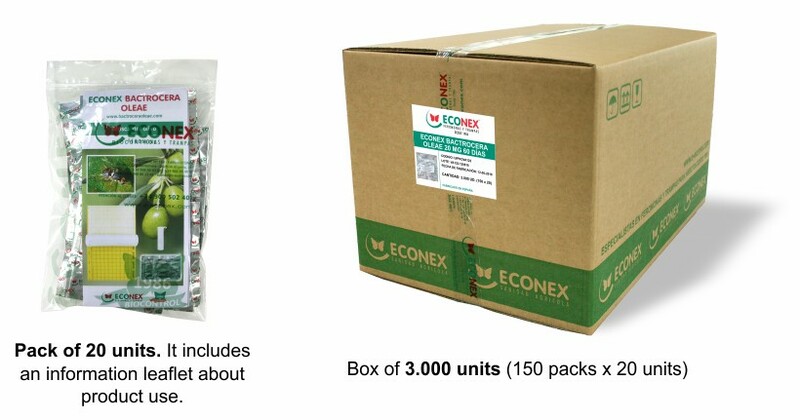 A 1 cm margin is left free of the adhesive along the longest side on both sides of the sheet. This is to make handling the sheet easier. It has a hole in each corner to make installing it easier.